A natural grass rug with border. Want a natural looking decor? Then try a sisal rug! Sisal and sisal-looking rugs give you a fresh, uncluttered look that will easily work with your decor. Sisal area rugs are perfect for a wide border. Just a splash of color, and your room is done. A natural wool rug with a row sisal weave. Grass (sisal) rugs have a beautiful natural look. They have two main drawbacks. While they look nice, they feel scratchy. Very scratchy. They are also difficult to clean. 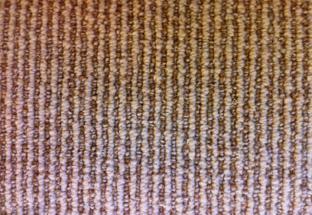 Today, we have wool and synthetic pile carpets that look just like sisal, but feel great and are easier to clean. Synthetic that looks just like a sisal rug. Looks like a sisal rug, but no scratchiness. Contemporary weave in a sisal rug. 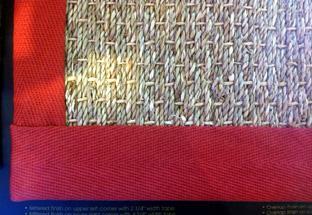 Add a fabric border to your sisal-look rug. Because most of our sisal and sisal-looking bases are carpets, it is easy for us to finish your rug to any size you want. Oriental design rugs limit your choice of sizes. But you are not limited with sisal rugs. Need a special shape? Again, no problem. 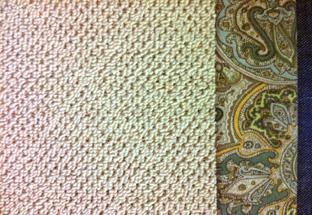 Sisal rugs come in the shape you want. Come visit today, and you will see everything you want in sisal.